This beautiful and restful four-season cottage near bay and ocean beaches combines the comfort and ease of modern amenities with the charm of exposed beams and natural pine floors. The building, a renovated barn, has two stories, fifteen by twenty feet, with an attached full bathroom. The cottage is now completely solar-powered. Downstairs the open floor plan has a comfortable seating area with a daybed/couch, a dining table, and a fully equipped kitchen. French doors lead to the delightful screened-in porch with table and chairs, creating a sense of continuous space, inside and out. Upstairs is light and airy, with windows looking over the back hill, gardens, and a large cherry tree full of songbirds. There is a high-quality queen bed and single bed by the windows (perfect for reading and daydreaming). The cottage is located on a large property next to a 150-year-old, cape-style farmhouse surrounded by vegetable and flower gardens. Organic vegetables, eggs and honey are all produced on the property and can be purchased when available. Situated in Pond Village in North Truro, bay beaches are just a ten minute walk down historic Pond Road. A two minute walk brings you to the village general store and two cafes, one serving artisanal chocolates made on premises. Ocean beaches are only a ten minute bike ride away. A TV, DVD player and WiFi allow you to connect to the modern world. There is basic cable, and newly-installed Apple TV with Netflix and many other venues to watch. There is also a basement with a washer/dryer and on-site parking. The Owners, Rob and Janice, are gracious hosts, respectful of your privacy and there for anything you may need. Summer visits are full of breezes, and winter stays are warmed by a state-of-the art heating system installed in 2013. This is an ideal getaway at any season for two or three people. My wife and I are both artists, teachers, and live on the property year round. Our son, who is 13, enjoys nature and raises butterflies in the summer, tends to the chickens, and loves to run and swim. We have spent years renovating and decorating the house and cottage which are both filled with beautiful artwork and good books. We spend a lot of our time cultivating vegetables and flowers, and raise chickens and bees. We eat the food we produce all year and enjoy selling produce to renters and neighbors when available. We loved the property the first minute we saw it and lived in the cottage ourselves for 12 summers. We were especially attracted to the rural feel of pond village and being surrounded by abundant nature, animal and bird life and the local culture of artists, tradesman and fisherman. We call it paradise, and the best kept secret on the outer Cape! Newly renovated with beautiful yellow pine floor. Cold Storage beach 1/2 mile or ten minute walk. Coastguard beach 1 1/2 miles or short bike ride. One and a half miles from ocean beach. 1/2 mile from bay beach. Both a lovely bike or walk on back country roads. Located within short walk to the village of North Truro where there is an excellent market/deli, two restaurants and and extraordinary Artisanal Chocolate Cafe. Public Library and playground. Efficient Rennai gas heater. Very warm in winter, cool in summer. Many books, fiction, poetry, history, local interest, nature guides. Delightful garden area with perennials, pear trees, organic herbs. Vegetables and eggs available from owner when available. Amazing Highlands golf course overlooking the Atlantic ocean! We loved our stay! I agree with all previous reviewers! The cottage is lovely - very homey and clean. The owners are so warm and accommodating! This part of the cape is very special - the beaches and walking trails are amazing. All in all a wonderful mini trip - would definitely return! A sweet cottage in a beautiful location with a perfect host. The cottage is humble, welcoming, and efficient. The bedroom, up a steep, narrow staircase, is especially nice, with a good number of windows that look out onto trees and a small hillside. There was an extraordinarily good chocolate bar upstairs, tangerines downstairs, and coffee and granola in the cupboard, little touches very much appreciated. The Salty Market, a short block away, is almost all you need for groceries, and a beach on the bay side of the cape is a calm fifteen-minute walk from there. A five- or ten-minute car trip takes you to a long wild beach on the Atlantic, and Provincetown is ten minutes farther. I very much enjoyed talking with the owner of the cottage. Great little place. Would definitely return. We certainly enjoyed our stay at this cozy, well equipped, yet rustic cottage in a farm-house setting in North Truro. Owners who occupy main house were not intrusive, and very helpful and kind during our visit. Cottage was converted from the original barn, but has modern appliances, insulated windows and doors, plenty of hot water and excellent heating. Great location close to beaches and Provincetown. The cottage is comfortable and spacious. Janice is welcoming and friendly. And the quiet atmosphere, a wonderful place to relax and rewind. I hope to return soon. This charming well-equipped cottage invites you to relax and let all your worries go. The spacious light-filled bedroom has a lovely view of the hillside. The beds are very comfortable. The kitchen was well stocked with condiments, spices, coffee and cream. Our next door hosts were delightful, fun and completely respectful of our privacy and space. It was hard to leave the comfort of the screened porch. We hope to return. 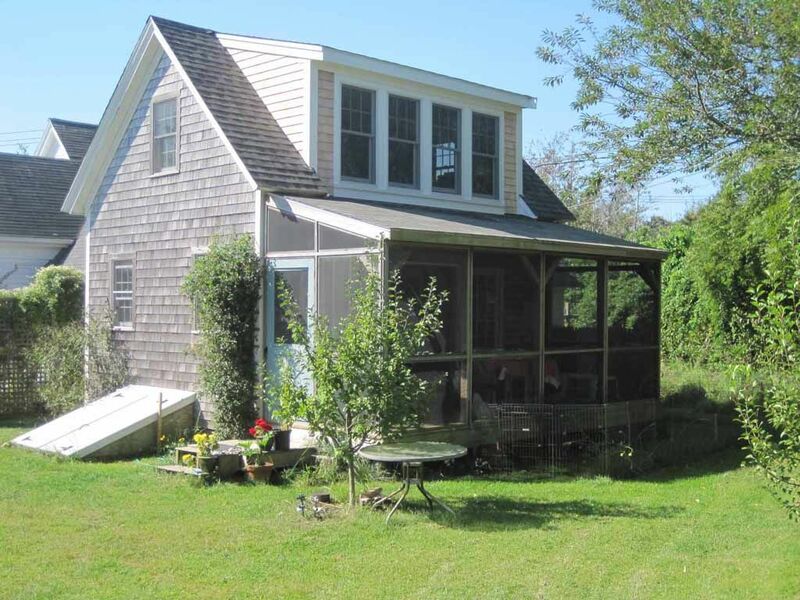 The cottage is located on the property of a 150 year old Cape farmhouse in Pond Village and surrounded by the Cape Cod National Seashore. There are many town and National Seashore beaches to choose from. Bike and hiking trails are nearby as well as freshwater ponds for swimming, golf course, and a winery just up the road. Provincetown is ten minutes away and has great restaurants, art galleries and museums, as well as the best whale watching trips on the east coast. For stays after July 1, 2019 renters will have to pay an additional 12.45% short term rental tax for all rentals in Massachusetts. Until Airbnb integrates this into their payment information the owners will ask for this at the time of booking. We are sad about this but the new state law requires us to collect rental tax now.